When I reviewed Forza Horizon 3, with its magnificent Australian background and near endless supply of activities, I remember pondering how the next entry could possibly top it. Well, my doubts have been thoroughly quashed after driving through the stunning British landscape in Forza Horizon 4. Not only does it have the most gorgeous vistas I’ve ever seen in a racing game (and arguably any game), but the map is continually peppered with icons of things to do. Yet even casual drives through the countryside offer tangible rewards to savor. Forza Horizon 4 thrusts you right into its biggest new feature, the inclusion of changes in seasons. The opening hours give you a sampling of how the environment changes in each season, how the road conditions require adjusting your controls, and how previously inaccessible areas become available as you move from Spring to Winter. The overall slice of the United Kingdom feels slightly smaller than the vast Australian Outback, with its forests and coastline, but the season changes alter the experience both visually and mechanically. It happens to such a shocking degree, it essentially feels like the game has four completely different maps. The seasons will change every seven days in real time, with each climate shift ushering in new events and challenges on top of the other daily and weekly timed activities. 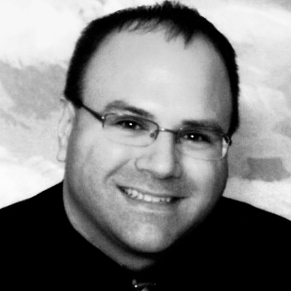 Persistent live servers have opened the floodgates, creating a shared world environment with other players. 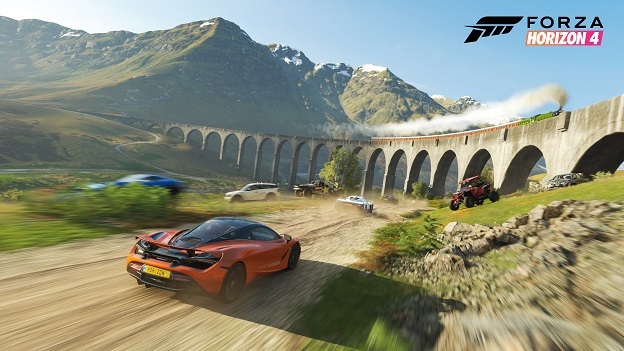 Instead of passing bland AI controlled Drivatars, now dozens of live players can be spotted doing more interesting things, such a careening off the side of a bridge or hopelessly chasing down sheep on a hillside. Forza Horizon 4 can seamlessly shift from multiplayer to single-player without load screens, but so far I haven’t felt any need to abandon a live session. Griefing is a moot point, thanks to player vehicles ghosting ethereally when in proximity unless both parties agree to join a convoy. Casually grouping up to complete communal tasks or engage in a quick street race feels less like a competitive affair and more like a fun joy ride, a quality that seems to permeate every part of the game. That’s not to say races aren’t a challenge. 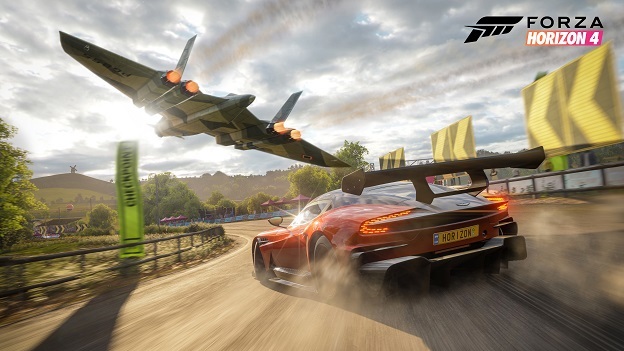 Forza Horizon 4 includes a vast array of tools to adjust the difficulty and alter the realism of the driving experience, with an uptick in rewards for testing the limits of your skill level. With 450 vehicles to acquire in the base game alone, each with its own handling quirks and terrain proficiencies, and the abilities to manually tweak everything under the hood, you’ll likely find at least a few beauties to consistently take out for a spin. Since the perk system has moved from a global tree in Forza Horizon 3 to one specific to each vehicle, your favorite rides can be optimized with buffs that will fill those reward gauges even faster. It seems like you’re always a short race away from a spin on the slot machine or the Super Wheelspin that loads you with a trio of prizes. New vehicles and plenty of credits you can spend are possible rewards, but now there’s a slew of avatar customizations to win, which consist of hats, shirts, shoes, and accessories, as well as emotes and dance moves eerily similar to those found in another game that starts with the letters “For.” Your avatar graces the results screen after every race, standing in front of a IMAX-size screen that compiles your experience, credits, and the new Influence currency that can be used to purchase rare cars and customizations. Also, it should be noted that everything is purchased through in-game currency, with not a whiff of microtransactions souring the air. 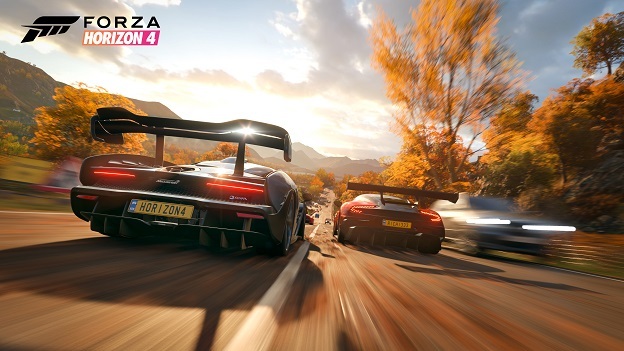 Along with the freedom to drive off the asphalt whenever you choose, Forza Horizon 4 also lets you invest your time in the activities you enjoy, with individual campaigns tallying on your My Horizon Life career page. If you prefer hitting those speed traps in a Bugatti or taking your Halo Warthog through the dirt racing series, your progression will unlock new races and activity locations for those specific events. The Showcase races should still be must-dos for everyone, pitting you against vehicles like a massive bomber jet or a ginormous hovercraft, peaking the cinematic scope of the Horizon Festival. I personally enjoyed the new stunt driver campaign, which puts you behind wheel in a secret agent action movie production, building a bit of fame and ego as the director takes more of a shine to you with each camera roll. The visuals in Forza Horizon 4 are so stunning, you may even feel guilty at times for zipping along at 150 mph to reach the next event and slow down to enjoy the scenery. You can even capture it in the photo mode. Using a drone for photography is another perfectly acceptable diversion. Fields basked in powdery snow, bright blooms in Spring, and the golden hues of Autumn, with fallen leaves strewn about the road, are all masterful examples of the attention to detail shown by the developers at Playground Games. The dynamic weather and lighting effects are equally impressive strokes of artistry that simply add to the realism of the world. The British setting is historically sound, with centuries old castles, churches, and other stonework adding more credence to the locale. The vehicles may be perfectly polished and blemish free, but they also sound pitch perfect. Engines roar and sputter, you can also feel the brake pads wearing thin through tight turns (a big thumbs up to the haptic feedback in the controller, by the way), and rivers sound like the Red Sea parting as you tread through them. Like the previous entry, there's a nice selection of music tracks from various genres to listen to as you drive through Forza Horizon 4. However, since Microsoft closed up Groove without integrating a third party music app, there is now no way to upload your own playlists. The Forza family of games continues to excel in technical quality and content quantity, raising the bar each year and giving the series a strong shot at being the best racing series ever. 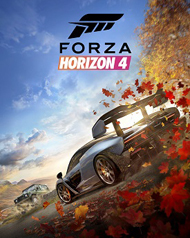 Forza Horizon 4 reinforces that statement with new ways to experience the joy of driving, whether alone, with friends, or fellow enthusiasts you happen to cross paths with in this gorgeous shared piece of Great Britain. Britain Like You’ve Never Seen it. Discover lakes, valleys, castles, and breathtaking scenery all in spectacular native 4K and HDR on the Xbox One X and Windows 10 PCs.